New Season of TaPS launches! I’m delighted to both announce and launch the forthcoming season of TaPS events for students of DP Theatre. Not to mention next year’s IB workshops (but more of those later). – Produces TaPS events in the Americas (New York), Europe (Manchester and London) and Asia (Kuala Lumpur, Jakarta and Hong Kong) for ALL DP Theatre schools, not just ISTA member schools. – Brings on board new master class leaders who are experts in their particular field of theatre to work with students on a range of theorists, theatre traditions and theatre skills. – Invites students to watch top class professional theatre productions in their role as audience and theatre makers and to take this learning back into their DP theatre classroom. 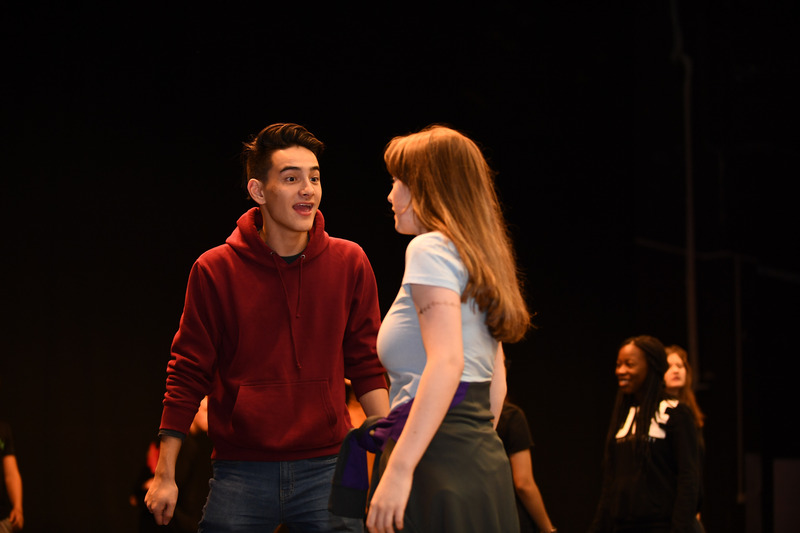 – Enables DP Theatre students to work with peers from other international schools which broadens their perspectives and results in the making of life long friendships. – Sees students leave TaPS inspired, enriched and eager to take their learning back into the two year programme. – Bears witness to students using the material learned at TaPS in subsequent core projects and assessment tasks. In this way TaPS certainly keeps its promise of acting as a springboard for further learning in DP Theatre. We acknowledge that sometimes it’s difficult to predict the numbers of DP Theatre students for next year, which is what you need to do to book and safely secure a place at this time of year. Please just give an approximate (this is OK!) and keep Jo updated on numbers as we progress towards the summer. We know numbers may be up or down come August when students sign up for the DP Theatre course so please don’t worry about this. The main thing is to approximate as accurately as you can and keep Jo posted! And please help us spread the word. The network of IB Theatre teachers globally is really strong. If you know of teachers who would benefit from bringing their students to TaPS – let them know of this unique and remarkable experience. Thanks – and any questions please don’t hesitate to email me (sally@ista.co.uk) or Ian (ian@ista.co.uk). As well as our season of TaPS we are also now launching our season of Category 1, 2 and 3 IB workshops for 2019-2020. You can attend an IB training on the back of TaPS or independently of TaPS – we offer both as we know the needs of teachers vary. Please go to the IB workshop listing to select the appropriate training for the coming year. ISTA offers formal and recognised IB training in all regions and at all levels, each year. IB workshops are a unique opportunity for invaluable PD as a DP Theatre teacher. Category 1 workshops are for teachers who are new to the programme; Category 2 workshops are for experienced DP Theatre teachers who are looking for clarity on the core components and assessment tasks; Category 3 workshops are for experienced DP Theatre teachers who are comfortable with delivering the course but who are looking for concrete and inspiring ways to develop as a practitioner. We currently offer Category 3 workshops in: Collaboratively creating original theatre; Teaching theatre traditions and Internal assessment. 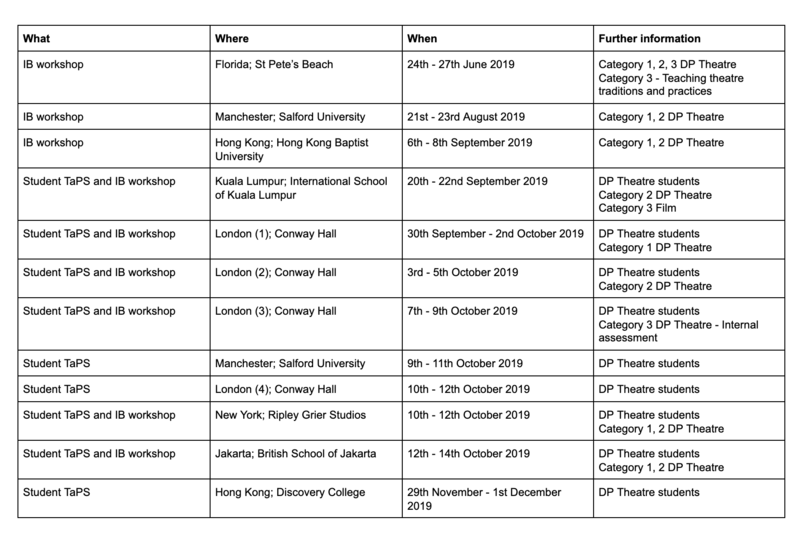 IB workshops also offer a great opportunity to develop your network of DP Theatre teachers which is an invaluable resource as you deliver the course.